A dating app with a hook-up reputation is getting it on IRL, too. 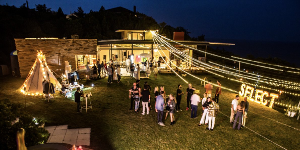 In July, the popular dating app hired event organizers to throw parties for its most exclusive members in a rented house in the Hamptons. Unfortunately, partygoers (and Tinder) were soon booted out. According to Page Six, attendees were also cited for carrying open containers and illegally parking. Hirtenstein’s house is located in an exclusive neighborhood in Montauk, in the so-called “Billionaires Row,” thanks to neighbors like Robert DeNiro and Ralph Lauren. As it turned out, Tinder didn’t have the proper permits to throw parties in the exclusive neighborhood, and they were over capacity. Tinder’s event organizers had constructed a garden teepee, skateboard ramp, and hired a DJ for the events. Elite members of the “Tinder Select” service were invited to come (as opposed to an open invite for regular Tinder users), and most invitations went to fashion designers, models, and New York socialites. Tinder has been a bit secretive about its exclusive service, meant for more high-profile users (actors, tech company founders, etc.) to protect their privacy when they are online dating. When Tinder was asked to shut down its initial party, they applied for a permit for their next event, calling it a “wedding” in the paperwork. The city of Montauk turned them down, refusing to grant them any permits. After being denied, they threw the second party anyway. In total, Tinder threw two parties in the month of July, and both were shut down. After all the complaints and legal problems, the company has stated there will be no more. Hirtenstein was adamant that he didn’t know about Tinder’s plans. According to Page Six, Tinder told him they were hosting “small, private events” when they rented the house for the month of July. When he heard about complaints from neighbors, he ordered the company to leave. According to Gizmodo, the parties cost $135,000 to throw, and now Tinder faces a $20,000 fine on top of that. The East Hampton town board has moved to seek a temporary restraining order against the company to prevent it from hosting any more parties. While Tinder meant for this to be an epic summer for its most prized customers, the company won’t be in the Hamptons again anytime soon. For more on this dating service you can check out our review of Tinder.